My Faux Fried Egg Porridge is both not and what it seems, resulting in a protein packed bowl of oats with a real difference. I’ve used Rude Healths porridge oats and coconut drink to create my creamy oat base and placed a tinned apricot half at its centre to resemble a vibrant and juicy looking yolk. For an even dippier egg, I like to blitz up some extra apricots and serve the fruit puree hidden under the ‘yolk’ half and in an egg cup on the side, to enjoy as you dip in. As well as an egg appearing on top of the porridge, I also like to include one in the actual oats itself. This may sound strange but adding the egg results in an extra creamy, filling and protein rich bowl of oats. I like to describe it as vanilla custard porridge and have the lovely Keri-anne Payne, ex Olympic open water swimmer and fellow porridge enthusiast to thank for introducing me to it. No fried egg is complete without a touch of seasoning, so I’ve used Halen Nom salt and Ndali vanilla powder in the guise of pepper to add a final flourish and flavour to the dish-while adding a salty and sweet vanilla custard hit. If vegan or not a fan of the added egg, the faux fried egg porridge recipe below can be created without its addition at the end. 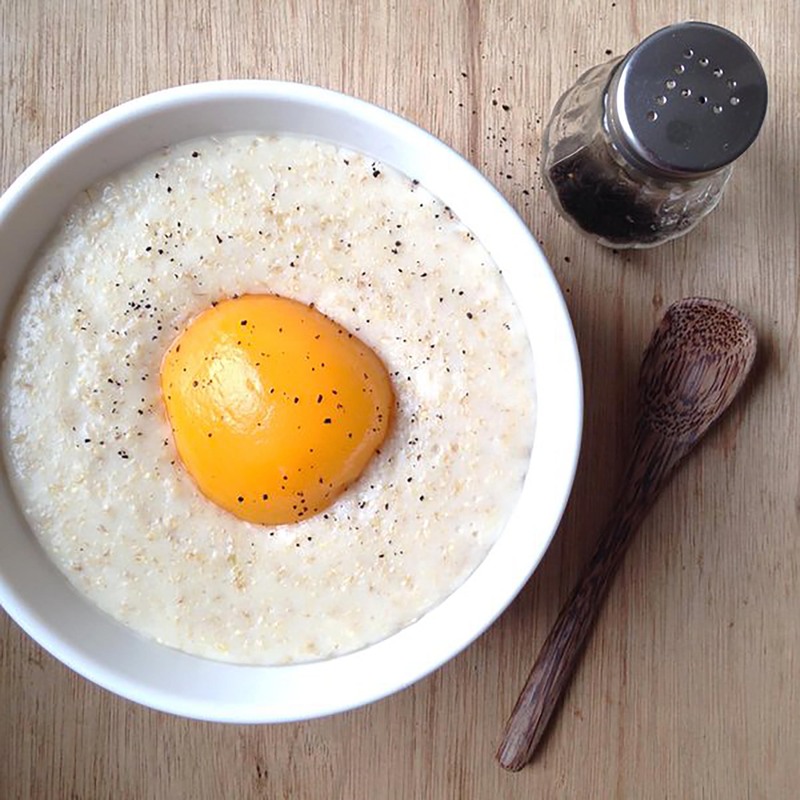 Either way here’s to sunny side up bowls of porridge, whatever the weather! Add the oats, water and milk to a small saucepan and stir everything to combine. Bring up to the boil slowly and simmer for 5-10 minutes, stirring occasionally until the oats have cooked, the mixture thickened and reached a creamy consistency. Add more water or milk according to your desired preference. Once cooked turn off the heat, and crack the egg into the oats. Stir constantly and confidently until smooth and creamy and the heat from the residual heat from the oats has cooked the egg. Transfer into a bowl. Set one of the apricot halves aside on a piece of kitchen towel and blitz up the remaining ones to create a coulis and sweeten if desired. Transfer into an egg cup. I like to store the remaining coulis in a clean and empty jar kept in the fridge to use in smoothies and on yogurt and ice-cream together with future bowls of porridge. Once your porridge has cooled down slightly, creating a surface slightly more stable, place a blob of the coulis at the centre of the bowl. Next carefully place your apricot half (drained and slightly patted dry with some kitchen towel if very slippy!) on top of the apricot coulis to disguise the hidden runny yolk beneath. Sweeten and season with vanilla powder, caster sugar and vanilla salt if using. Ideally placed in a salt and pepper shaker to mimic the traditional seasoning. Enjoy, adding more runny yolk coulis for extra flavour and fun!